Now that I’ve gotten past some big deadlines, I’ve suddenly found myself able to sew things just for fun. Just because I want to. It’s liberating and intimidating, all at the same time. Some days, I can’t figure out where to start so I end up doing fun things like laundry. Others, I head to the sewing machine and don’t move until it’s time to get my daughter from the bus. My session with Allie the Owl fell under the second scenario. I’ve been in love with owls since forever and I knew I’d take a crack at Elizabeth Hartman’s pattern at some point. We had some beautiful bolts of Shimmer 2 at the shop, so I started there and pulled in a gorgeous blue linen/cotton blend (Mochi by Moda) for the background. I was in such a hurry to make this thing, that apparently I could not be bothered to either cut or sew a straight line. As a result, some of my matching is … off. Some days, you just accept the imperfections and this is one of those days. I’d originally planned to do a loose, all over quilting pattern, using a light gray thread over the owl and a matching thread to the background. But then I got in the groove and went a little crazy with the background. OK, a lot crazy. I found a quilt on Pinterest that used a similar free-motion quilting design and just ran with it. I didn’t do much marking: I used the width of my palm to help with spacing the first line of quilting (the long, wavy line) and I did use chalk to mark about halfway between those lines to give myself a stopping point for the scallops. Other than that, I just winged it. It’s a pretty dense amount of quilting and I probably should have taken more breaks than I did because my shoulders and upper back were killing me the next day. But I’m happy with how it turned out and maybe the quilting helps keep people from noticing all those mismatched seams! I really love the styling of the Oliver + S patterns and just finished up another outfit. This time I combined the Puppet Show shorts with the Swingset Tunic. The shorts are made with a pretty natural-colored linen. Very soft and summery, I think. I goofed on the bias leg binding this time (and really couldn’t tell you what I did wrong), so the legs aren’t gathered quite as much as they should be. I think they still turned out rather cute and Miss L loves them (the pockets are probably her favorite part). I knew right away that this embroidered cotton in my stash would be perfect for the top, especially with the linen shorts. (Please excuse all the wrinkles. Our photo shoot was hours after we got dressed and ran errands.) It’s just a soft floral motif with vines and daisies. Very understated. The back has buttons at the top of the bodice and I had three small floral buttons that were just perfect. With the hot and humid summers we have here, I can expect to get a lot of use out of this outfit. And I’m glad because I love how it turned out. A Pirate, a Princess, a Highlander and … Jane Austen? 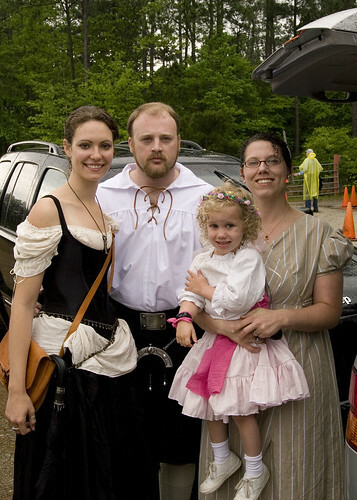 My sweetie pie cousin and her honey came for a visit again this weekend, this time so we could all go to the RenFest. While the weather has been pretty nice all week, it rained yesterday. On and off. All day. Any plans I had to take lots of great pictures at the RenFest were dashed, since I didn’t have much interest in ruining my 30D. We did manage to snap a couple of pictures in the parking lot before heading inside. Gotta love that scenic backdrop! LOL! I asked Miss L if she wanted to be a pirate or a princess for the trip. “I want to be a princess pirate,” she declared. A peasant top (from her Halloween costume), pink tiered skirt, sash and flowered crown later — ta da! And then there’s me, all decked out in my Regency era finest. I have been wanting to do some Regency sewing for some time (and this most definitely will be the first of many for both me and the little missy), and since many people where all kinds of costumed dress at the RenFest, I figured “why not?” The pattern is by Sense & Sensibility; the fabric is a cotton/linen blend from Joann’s. I love it! It’s very comfortable, although I do wish I’d made the sleeve bands just a teensy bit wider. Also, I have not yet made a set of stays for underneath, so I had to wear a sports bra to get the bodice to fit even close to the proper way. Which meant I spent much of the day fighting to get the straps hidden under the neckline.